Pilot Studies is an ongoing publishing project, initiated by InCUBATE and involving a wide range of collaborators, to gather strategies and perspectives on how to organize and support noncommercial, grassroots and community-based creative projects. Pilot Studies is an ongoing publishing project, initiated by InCUBATE and involving a wide range of collaborators, to gather strategies and perspectives on how to organize and support noncommercial, grassroots and community-based creative projects. Pilot Studies takes the form of short booklets containing reflections, essays, how-to guides, and interviews, written by artists, arts administrators, and creative thinkers across the country. 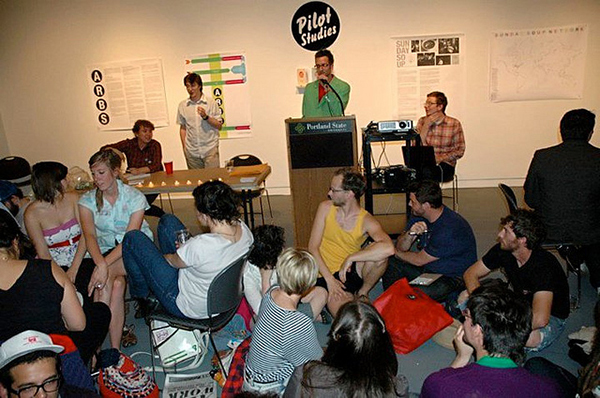 We launched PilotStudies at the Open Engagement conference at Portland State University in May 2010. Since initiating this project, we realized that in order to make Pilot Studies an actual resource for creative organizers locally and nationally we need to both distribute it widely and to give this project a sustainable infrastructure of time, space and money.